Evan Watson of Plan Bee Farm Brewery pouring a sour Bouquet into a tasting glass. Sour beer is not the easiest to brew. This ancient, tart, wine-like style is generally made with lactobacillus, a type of bacteria also used to sour pickles, yogurt, and sauerkraut that inoculates the beer in ways that can be difficult to control. In addition, sour beers are mostly fermented with wild-style yeast, or true wild yeast (yeast that literally flies in through an open window and starts fermenting the beer). 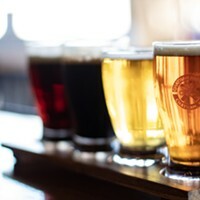 These wild yeast strains are generally a type of yeast called Brettanomyces—referred to affectionately as "Brett" by beer lovers—which imparts a barnyard earthiness, or good "funk," when properly incorporated but can create a moldy, rotten cheese flavor when it goes astray. Brett can also spread to other, nonsour beers infecting them and the otherwise sterile brewing equipment, which is why generations of breweries worked hard to keep these strains out of the brewery. Often sours are aged in barrels for months or even years and sometimes the hard-to-control process results in overly pungent bad batches that have to be poured down the drain. After all those long months of waiting and experimenting when the beer finally reaches the lips of a beer drinker the reaction is...well...if that beer drinker is not a sour fan already, often one of distaste. "I think it's almost like when you're a kid when you try coffee for the first time you don't like it, but then clearly we all develop a taste for it," says Adam Watson, co-owner of Sloop Brewing Co. in Elizaville. For the ever-growing number of sour-beer disciples, very few drinks can compare with the tart, refreshing, intriguing, and sometimes downright inspiring experience of sipping a good sour. "I think sour beers are a part of almost everybody's repertoire now, to varying degrees, especially at newer breweries," says Christopher Basso, brewmaster at Newburgh Brewing Co. Breweries in the Hudson Valley and surrounding area are no exception to that trend and are producing an assortment of great sours—from approachable to complex—that are among the best examples of the style you can find anywhere. Some sour-beer styles, such as a Gose or Berliner Weisse, are mildly sour beers with an almost lemonade quality. Simple Sour, brewed by the Peekskill Brewery, is a Berliner Weisse that's a very popular and approachable sour that's developed a cult following in New York City. "It sells better in the summer here, but in Brooklyn it's all year round," head brewer Matthew Levy says. Peekskill also produces a wild fermented aged sour that is created with wild yeast by means of a coolship—a traditional fermentation system that allows the beer to be infected/inoculated by yeast that blows in through an open window. This process is used to create the brewery's lambic-style ale, which is offered once a year. This year's batch will be released in August, and Levy expects it to be an intense sour with unique flavors. Sloop Brewing brews sours including the Black Razz, black sour ale brewed with raspberries and aged in oak and the Saur Peach, a Berliner Weisse brewed with peaches. Watson says the demand for sours from customers has allowed it to become a specialty at Sloop. "We always loved sour beers even before we started the brewery, and we knew that was a style we were going to focus on [but] it's turning into a focus for sure." Many of the mild sour beers on the market are created with what's called the kettle-sour method, where beers are soured by lactobacillus bacteria (which eats the sugars and converts them to acids to produce the desired pucker) earlier in the brewing process. This is quicker, less expensive and less likely to infect the brewing system than the traditional method, but it produces markedly different flavors. "It's a little more one-dimensional in a way, [but] it gives a really nice acidity and it can be really refreshing," Basso explains of this method. At Newburgh Brewing Co. he uses the technique to create beers like the Checkpoint Charlie Berliner Weisse, and CAFE Sour, a sour brewed with Ethiopian coffee beans and teff, a popular Ethiopian grain. The more traditional and time-consuming method of brewing sours is barrel aging, and entails adding the lactobacillus brewing later in the process and letting it react with the beer over a period of months in a wooden barrel. "Over time in the wooden barrel they're going to produce that acidity as well as lots of really interesting, complex, earthy funkiness," Basso says. Because of the time it takes to age these beers, Newburgh has only recently started releasing beers brewed in this fashion. One of the brewery's first barrel-aged sours is called Sur Lie and is currently available. But it's far from the only barrel-aged sour produced in this area. 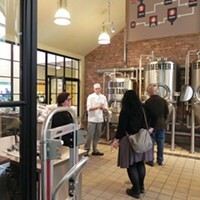 Christopher Basso inspects the brewing operations at Newburgh Brewing Company. Some of the most sought-after aged beers in the region are produced at the Brewery at Bacchus in New Paltz. Head brewer Mike Renganeschi explains that their sours are all barrel aged, with the youngest being released after nine months and the oldest having surpassed its two-year anniversary. Once a beer is aged it is often blended with other younger or older beers to create the desired flavors. "Our flavor profile is mainly a bright lemony essence," Renganeschi says. But that's about as much as he can narrow it down with a general description as the brewing process is designed to be unpredictable. "In regular beer making, there's usually one single organism at work, one yeast strain that makes pretty much one flavor, and that's how you get the repeatability of a lot of beers," Renganeschi says. "In sour beer there are hundreds, if not thousands, of bacteria and yeast working and all these micro ecosystems of yeasts, so if one outperforms another it changes the character of that beer over time." Regular beer series at Bacchus include the Et Cetera, a farmhouse sour, and Lilith, which is aged for more than a year with raspberries. Each batch of these beers is numbered to indicate that the beer flavor changes. Plan Bee Farm Brewery in Poughkeepsie brews sour and wild ales and is dedicated to producing its beers with 100 percent New York ingredients. "[That] includes grains and hops and fruits but also yeast," says brewer Evan Watson, who owns the brewery along with his wife Emily. "It's kind of a historic way of brewing without the laboratory technology of isolating single cells of yeast. [In the past] beers were much more wild then they are now—now they're very homogenized." Plan Bee's sours are made with a coolship and aged in fermenters that were custom-made from New York white oak. Captain Lawrence Brewing in Elmsford has a celebrated sour-beer program that has inspired several Hudson Valley brewers including Watson and Levy, who both worked there. Captain Lawrence owner and brewer Scott Vaccaro says one of the secrets to brewing good sour beers is having a willingness to pour batches that don't turn out well down the drain, instead of trying to mix them with better-tasting batches. The aged sours offered by Captain Lawrence include Great American Beer Festival Gold Medal winners such as the Cuvee de Castleton and the Barrel Select Gold, a lightly sour, almost saison-tasting brew. Vaccaro says these beers don't pay the bills but have paid dividends in prestige. "They're a very tiny percentage of our overall business but we've garnered a lot of notoriety for making them—we've won four gold medals from the Great American Beer Festival for sour beers: For that I love them and for the flavor I love them," he says. Erik Ofgang is the author of Buzzed: Beers, Booze, and Coffee Brews (Islandport Press), a guide to the best craft beverages in New England that will be released by this spring. 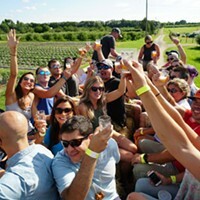 Five great examples of sour beer being brewed in the area.